A stylish unit in the ” hinged lid” category, the Beaumark BM800 has both these safety features, the usual halogen advantages of speed, convenience and low cost AND the rotisserie idea first seen on our pages for the Visicook-Airchef. The AirWave certainly is made to a high standard, when raised some of the “hinged lid” type cookers do tend to wobble a bit, not so with this product. Beaumark has quite a large volume, its shape , almost spherical makes it ideal for full size pizza cooking in addition to the well designed spit roast idea. Although it didn’t have quite the high temperature settings of many other halogen cookers ( up to 210 deg C … most go to 250 deg C ) most dishes are cookable with no problem at all, maybe extending the time a little. It is still fast, at least 1/2 the time of any conventional cooker. The top hinges away, a great safety feature, no burnt hands getting the food out of a red hot bowl ! In practice we found the Beaumark was a good practical oven, its lack of top temperature wasn’t such a minus point, the insulation of the body of the unit tended to keep almost all the heat in and as the circulation of air was so good, especially when using the tall rack or the rotisserie , it cooked in a very good time anyway. The markings on the dial type controls are like many others today, only printed on and may disappear over time, I’ve had a moan about this before ! For Chips, I would say that pre prepared frozen chips tended to give better looking results, with fresh cut chips which were then par boiled before air frying , could be a little worn away by the action of the rotisserie. 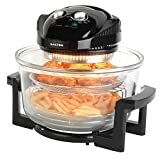 My own favourite method, using the air fryer attachment on an ordinary halogen oven, beat the Beaumark results for quality, but did need a little attention during cooking. I did notice some comments about the limitations of size of bird possible with the rotisserie , but don’t forget that this is removeable and the Beaumark, like any other halogen oven can cook a bigger Chicken on the lower rack, true it doesn’t have an extender ring which is always a plus when cooking chickens, but it managed to do a very tasty , 1.6kg chicken, which would serve 4, on the lower rack cooking it perfectly, turning half way through. What buyers of the Beaumark Said…. I bought this particular cooker because it has a rotisserie and I haven’t been disappointed. Lamb, beef & chicken so far and all successful, though the timing is a bit hit and miss as there’s not much available recipe wise. It is quite large but quite light and easily cleaned. Overall a good product.